When a dog dies, people often hesitate to get another one. They know they can’t really replace their pet, and they’re not sure they want to go through the heartache again. Chris Kowalewski and her husband had lost two pets in a two-year period, and she was experiencing these common reactions. “My husband works the night shift though, and I was having a hard time sleeping at night since our dog passed. I started looking at Petfinder and cried every time I looked at all the photos,” the Oswego, IL, woman says. Nigel’s brown eyes are hard to resist. One dog, in particular, caught her eye. His name was Nigel, and he was listed on Petfinder by Placing Paws of Illinois in Libertyville. She looked for his listing again the next day, but he was gone. Her husband met Nigel the next day, and he agreed with her assessment, so they brought the kids to meet the pooch. Nigel has fit right in. “The weirdest thing is that he has the perfect mix of our previous dogs’ personalities,” Chris says. 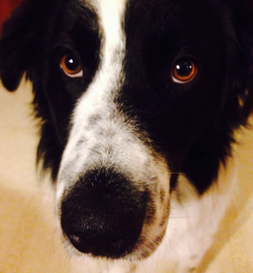 Nigel hasn’t replaced their former dogs; he is another furry bonus for the Kowalewski family.